Award wining artisan organic butcher in the heart of Victoria Park, East London. Specialists in rare breeds from the Ginger Pig Farm in Yorkshire. The Ginger Pig is run by organic farmers who like to work with happy animals – that’s why their fantastic range of meats and pies are among the best in London! The Ginger Pig organic farm is based in the green dales of Yorkshire. 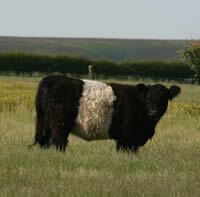 Its specialises in traditional and rare breeds including Tamworths, Texels and Gloucester Old Spots. All Ginger Pig meats come from their own farms, where they also grow the crops to feed the animals – allowing complete control over the food chain. 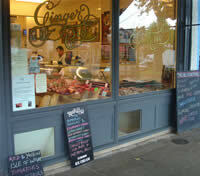 At the Ginger Pig butcher shop in Victoria Park, the range of fresh organic meat includes beef, pork and lamb, in every conceivable cut, from animals reared on the North Yorkshire farm. With these skilled butchers, there is no shortage of advice on how to cook more unusual cuts - so be adventurous! In addition to finest quality meats, try the delicious pies – made using their own traditional recipes, meats from the Ginger Pig farm of course and handmade pastry. You can also buy sausage rolls, cooked meals (ham, beef, traditional corned beef) and ready meals to take home (lasagne, cassoulet). For accompaniments, downstairs there is a small deli, with lots of wonderful artisan foods including Neal's Yard cheeses, a selection of vegetables, quiches, chutneys, olives and oils.